Getting to Know Alta, CA. Alta is a small unincorporated community located in Placer County and about 30 miles northeast of Auburn and 40 miles west of Truckee. The community of Alta is located off of Interstate 80 and along the historic Transcontinental Railroad route. Its Elevation is approximately 3,700 feet. Alta was founded in 1866 as a railroad town along the transcontinental Central Pacific rail line. Completed in 1869, the town had a hotel, among other amenities. Its neighbors, Dutch Flat and Gold Run, were mining communities. Yet the histories of small towns in the Sierra were shaped almost as much by the railroad as they were by the discovery of the Mother Lode. It's a beautiful place, with mixed conifer and oak forest with four clearly defined seasons. Approximately 31 miles away is located Sugar Bowl Ski Resort and Boreal Mountain. Each of these resorts is close to "all weather” Interstate 80 and a short trip from Alta California. 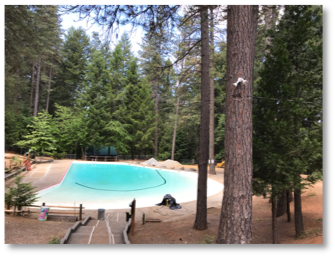 Dutch Flat Pool is a community resource and a place for the local community to hangout swim and picnic. It started life as a muddy swimming hole and formalized in its current state more than 50 years ago. Lovers Leap is a source for an Indian legend and interesting rock formation. Lovers Leap is a physical feature on Lover’s Leap Road. Hydroelectric production was born in the Bear River watershed. 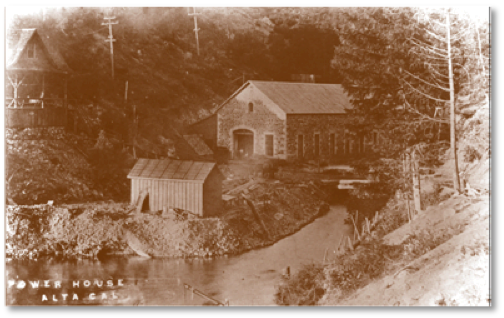 The Alta Powerhouse (1902), presently owned by PG&E, is the oldest functioning hydroelectric plant in California. Euchre Trail - This trail along the North Fork of the American River. The portion along the river is 5.28 miles, with opportunities for fishing, camping, and swimming. It passes old mining ruins and abandoned equipment from the Gold Rush era. Trailhead is at Iron Point, near Casa Loma off of Interstate 80.